In 2018 the Office of National Statistics flagged that the UK construction sector was second only to administrative and support services in losing more businesses to insolvency. With £1,500 of working time spent on physical paperwork for every employee in the UK construction sector, fast-track technology adoption to address basic inefficiencies, which have seen the sector become the least productive per person in the UK, must be implemented. 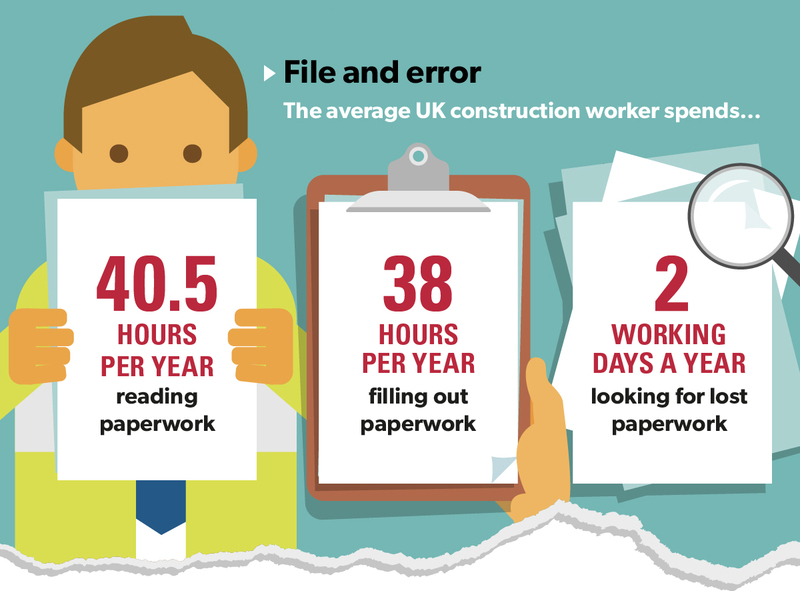 UK Construction workers spend an average of 90 hours a year per employee on paperwork, comprising nearly 40 hours reading paperwork, 38 hours filling out forms and 14hours searching for mislaid documents according to a national study from Re-flow conducted by YouGov. 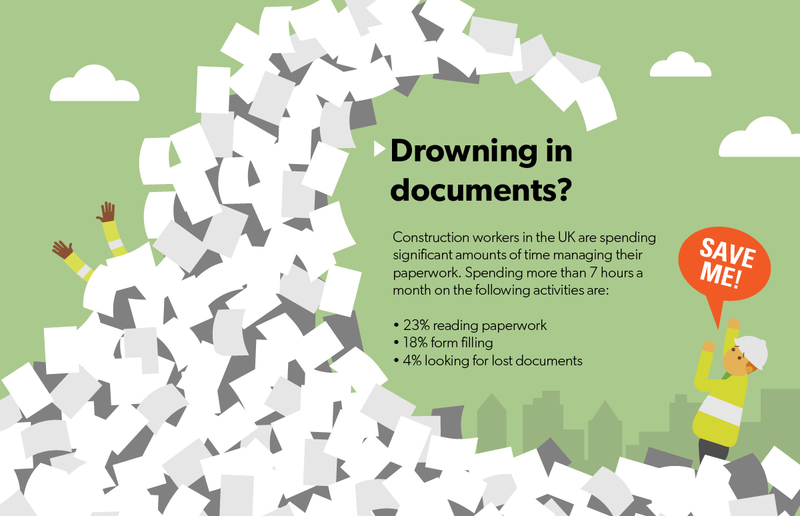 With an average weekly salary of £607 according to the Office of National Statistics in 2018, paperwork alone is costing the construction sector nearly £1,500 per employee every year. 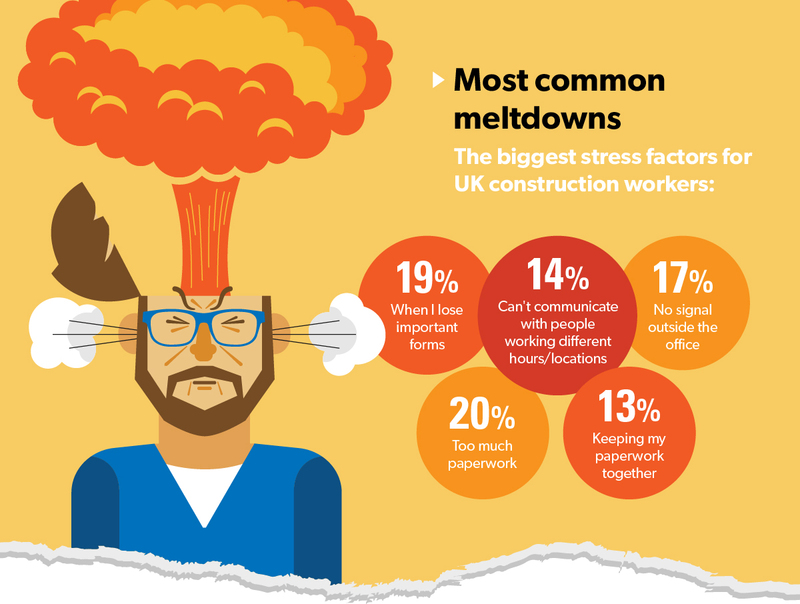 There is a high proportion of workers (23%) in the construction sector who are spending a large amount of time (more than 7 hours a month) on their paperwork and 20% of construction sector workers are stressed about the amount of paperwork they have to read and complete. Completing manual paperwork also creates other stress factors for construction workers. •	One in ten (10%) find it stressful trying to interpret other people’s handwriting. 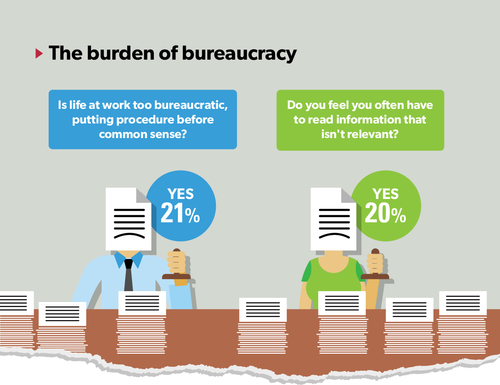 •	13% are stressed about trying to keep related paperwork together. •	19% get stressed about losing important forms. With such high volumes of traditional form filling and paper work sheets in the UK construction sector, a more flexible approach to what information is required and how easy it is to update changes is a key factor. Static forms often try to cover all bases by containing information to cover a range of circumstances and eventualities, but this places a requirement on those completing the forms to sift through this information and decide what is relevant. This has led to one in five construction workers (20%) reporting that that they’re often reading information that isn’t relevant to the work they’re doing. 21% of workers feel stressed about not being able to change plans once they’ve been shared with other people. By not embracing digital technologies, simple administration tasks are taking more time, increasing the risk of outdated information being followed and making workers feel unnecessarily stressed. For workers on jobs that have experienced any unplanned downtime or other factors that stop them being able to complete scheduled work, a development in digital paperwork has been time, date and location stamps, which provide evidence of when and where work was, or attempted to, be completed, which would go some way to address the 19% of construction workers who feel unconvinced that people are completing work when they say they are. 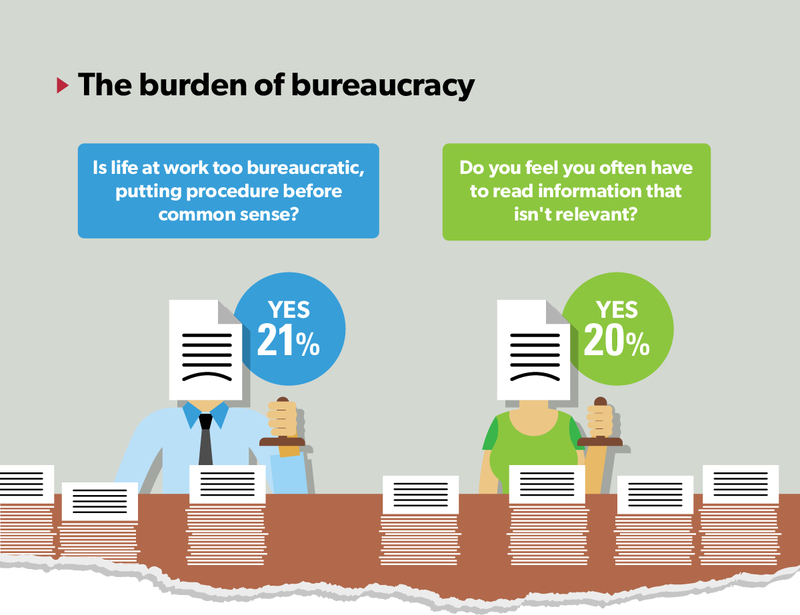 There are a further 8% who themselves get stressed about being able to provide evidence of what work they have completed and when, which could be easily solved with log and locate functionality. With a range of digital options going mainstream in the new age of BIM construction, we’re seeing a shift in the adoption of technology among construction workers. Today, 61% of construction workers carry a smartphone with them at work, but only 34% often carry digital copies of work documents with them meaning there is some work to do in encouraging workers to adopt a digital alternative to paper. However, only 7% would rather continue using a less suitable piece of software than learn how to use a new software if it was more suitable for their job, which highlights that the sector is willing to change for progress. 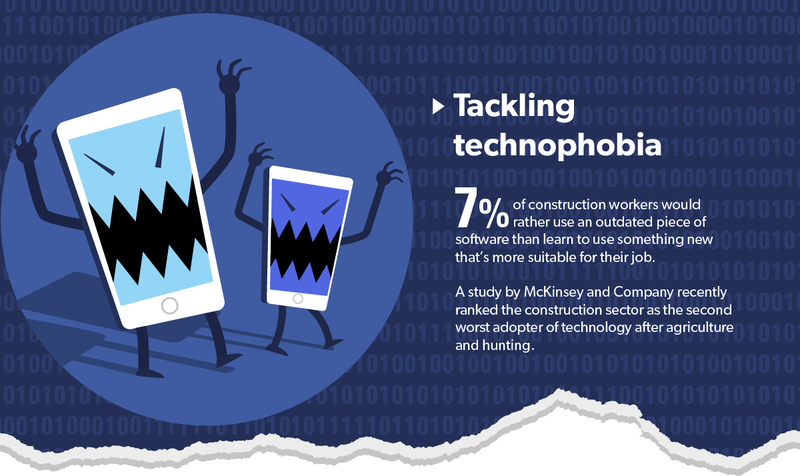 Another stress factor to consider is adopting software that displays consistently across all devices construction workers use, as software that glitches between devices would stress out 9% of staff. With Re-flow field management software, you can centrally control your jobs on location and achieve outstanding workflow management. Our desktop dashboard gives you powerful job command functionality, and in the field, our ultra-stable app won’t let you down. As your workers complete tasks and information, data comes back to the dashboard, instantly highlighting what’s been accomplished. All figures, unless otherwise stated, are from YouGov Plc. Total sample size was 4172 adults of which 2265 were workers. Fieldwork was undertaken between 5th - 7th February 2019. The survey was carried out online. The figures have been weighted and are representative of all UK adults (aged 18+). All yearly averages and salary costs were calculated by Re-flow based on YouGov’s figures. This press release was distributed by ResponseSource Press Release Wire on behalf of Re-Flow in the following categories: Business & Finance, Computing & Telecoms, Construction & Property, for more information visit https://pressreleasewire.responsesource.com/about.